Home Health	Black seed oil – The cure all? 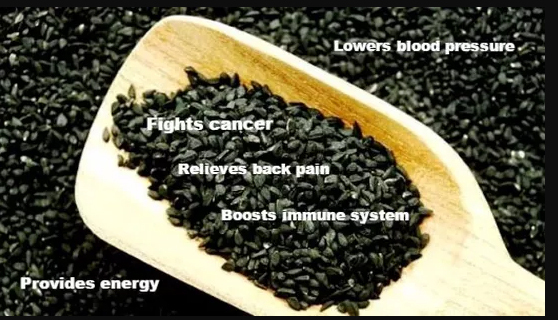 Nigella Sativa also known as Black seed oil(BSO) has been known since the 7th century AD as the “cure to all diseases except death”. BSO is one of the most mysterious and intriguing natural phenoms that I’ve ever encountered. It’s only by chance that I discovered this incredible Godsend, as a friend of mine was informed of the BSO by someone she barely knew. At the time I was not aware of it, but my discovery of BSO was about to start a new chapter of health and vibrancy in my life. I eventually bought the oil from a local health food store and put it in my cupboard for a few weeks before I decided to research it on the internet. When I finally started to google BSO I couldn’t believe what I was reading, the medical research, the acclaimed cures and the benefits of using this oil were unbelievable. So what gives BSO its super curative powers? Thymoquinone, hypothymoquinone, and thymol. From these three birthed these elixir like properties: Analgesic, Antibacterial, Anti-inflammatory, Anti-ulcer, Anti-cholinergic, Anti-fungal, Anti-hypertensive, Antioxidant, Antispasmodic, Antiviral, Immune system booster, and metabolism booster. Here are a few of BSO’s benefits as documented by the US National Library of Medical Research. Cancer – BSO is reputed to help prevent and treat cancer through a variety of mechanisms: Anti-proliferation, Apoptosis, Cell cycle arrest, Anti-metastasis, and Anti-angiogenesis. I’ve read many testimonials on forums and reviews on Amazon where people have proclaimed to have been cured from brain to prostate cancer by BSO. Heart disease – Rich with unsaturated omega 6/9 fatty acids and phytosterols, BSO helps fortify and increase the elasticity of blood vessel walls. It also decreases capillary fragility and permeability while also preventing thrombus formation and decreasing arterial pressure. It also decreases blood cholesterol by preventing the formation of atherosclerotic plaque, as well as preventing inflammatory elements in the cardiovascular system. Diabetes – According to researchers from the Indian Council of Medical Research BSO causes gradual partial regeneration of pancreatic beta-cells, increases the lowered serum insulin concentrations and decreases the elevated serum glucose. This is quite interesting because BSO is one of the few natural plant derivatives that is acclaimed to help prevent type 1 and 2 diabetes. Weight Loss – BSO is an excellent anti-inflammatory agent that is reputed to help people lose excess weight much in the same way that it helps diabetics. Specifically by decreasing weight gain triggers such as Appetite Glucose, Liver gluconeogenesis, Blood glucose levels, and Cholesterol Triglycerides. HIV– According to the African Journal of Traditional, Complementary and Alternative Medicine, an HIV patient went into complete remission after powdered black seed(not the oil extract) treatment. The patient was treated with black seeds for a period of six months, after which there was no detectable HIV virus or antibodies in his bloodstream. Hair & Skin – Incredibly BSO helps to restore hair loss, but It’s not quite understood why it happens. Iranian researchers have found BSO as effective as the skin cream Betamethasone in improving quality of life and decreasing the severity of hand eczema. Anti-bacterial – In 1997 researchers at the Department of Pharmacy, University of Dhaka Bangladesh conducted a study in which the antibacterial activity of BSO was compared with five antibiotics ampicillin, tetracycline, cotrimoxazole, gentamicin, and nalidixic acid. BSO proved to be more effective against many strains of bacteria including those known to be highly resistant to drugs. Within the first 3 weeks of using BSO (taking three tsp’s a day), I experienced some incredible developments. On the 4th day, I noticed a patch of protruding varicose veins on my left calf that I’ve had for years just disappeared. Unbelievably my calf now looked like it had been re-chiseled to perfection by Michael Angelo. My skin looks and feels like a baby, and I also started to feel this general sense of well being. My eyesight has slightly improved and I sometimes forget I’m not wearing my glasses. I used to bare-knuckle a punching bag when I was a teenager which caused me to develop permanent callus overgrowth on my pinky knuckle on both hands. Without topically applying the oil about 90% of the callus has disappeared on both hands. The BSO health benefits list goes on and on, it’s quite miraculous. It seemed even the Ancient Egyptians had a fascination with BSO. Cleopatra & Queen Nefertiti used black seed oil to bring luster to their hair and length to their nails. Archaeologists also found a bottle of black seed oil in King Tuts tomb for use in the afterlife. If I didn’t see & experience the benefits of BSO myself and see it with my own eyes I wouldn’t have believed it. BSO has become a permanent fixture in my medicine cabinet. If you’re going to buy BSO make sure it is cold pressed and organic, the brand I used is Amazing Herbs Black Seed Oil. You can buy Amazing Herbs Black Seed Oil at Vitamin Shoppe and on Amazon, but it’s about 30% cheaper on Amazon.